Neil Young News: Meta Reviews: Neil Young's "Peace Trail"
Neil Young's newest album "Peace Trail" is due to be released today, December 9, Friday. Legendary rocker Neil Young continues to add to his 50-plus-year recording career with his just-released studio album Peace Trail. A shrewd collection of new songs, written and recorded quickly this past summer, the album is one of immediacy, with kinetic playing from a spare crew of Jim Keltner on drums and Paul Bushnell on bass. With bits of processed vocals added to the folk-rock core, and an amplified harmonica that sounds like Little Walter after a Marvel-esque dose of radiation, Young employs strategies meant to throw the whole thing off kilter and make you listen closer. The songs cover the things on the singer's mind right now, both within—old dreams broken and those newly forming—and in the world around him: Standing Rock, xenophobia, immigration, and technology. For an artist at 71, it's beautifully charged, invigorated, and present work. While the call is urgent, Young doesn't beat you over the head with the message so much as inject you with it. Sometimes Neil Young makes music for the ages; other times – as on his second album of 2016, following June's folk-absurdist amalgam Earth – Young makes music for the news cycle. Recorded in four days, Peace Trail contains casual social and political observations set to folk tracks improvised alongside drummer Jim Keltner and bassist Paul Bushnell. Young's latest batch of tunes righteously rebuke the Dakota Access Pipeline, trigger-happy cops, environmental malfeasance and smartphone zombies. While many of his rock peers spend their late-era careers recording cover albums and embarking on wildly lucrative tours, Neil Young, 71, is as prolific and fiery as ever. And given the heightened political climate into which he releases his latest studio album Peace Trail (** and a half out of ****, out Fri.), there's no shortage of societal ills for the legendary singer-songwriter to condemn, his trademark reedy voice only slightly shakier with age. But in 2016, protest music looks, and sounds, much different than the guitar-strumming screeds Young has spent his career recording. As this point, he's documented a half-century of injustice in song, from early favorites like Southern Man and Ohio to more recent crusades against Monsanto and big agribusiness. And from the sounds of Peace Trail, the weight of the world is still sitting heavy on Young’s shoulders. His new songs pulse with immediacy, moving down a checklist of 2016’s most salient political topics, particularly the Dakota Access Pipeline protests. Over pow-wow drums and acoustic guitars, highlights Indian Givers and the album's title track paint a dramatic picture of the conflict at Standing Rock, the songs’ heroes fighting for the fundamental right to their land. "There’s a battle ragin’ on the sacred land / Our brothers and sisters had to take a stand," he sings on Indian Givers. Meanwhile, John Oaks tells a story of police brutality from a different perspective, focusing on a farmer struggling to protect his workers, killed in his truck by an officer's gun. Peace Trail sees Young in Woody Guthrie mode, disinterested in beautiful turns of phrase, opting for spare arrangements and plainspoken storytelling. At its best, it's almost comforting to hear him paint precarious current events as noble, good-versus-evil crusades. But as is the case with many of his later, social justice-minded recordings, he walks a fine line between truth-telling and ornery. On Peace Trail's weakest moments, Young sounds less like a soothsaying voice of reason and more like an old man railing against new technology he doesn’t understand. At times, that's intentional. "I'm lost in this new generation, left me behind it seems / Listening to the shadow of Jimi Hendrix, Purple Haze sounding like TV," he sings on My Pledge over disembodied Auto-Tuned vocals. As valid as Young's complaints are, that technology has rendered humans devoid of empathy, he often adds flourishes of electronic music that make his point too literally, particularly the chorus of automated voices on album closer My New Robot. And for a new generation of listeners, who’ve connected with the rallying cries of Kendrick Lamar’s Alright and the charged imagery of Beyonce’s Formation video, Peace Trail's guitar-strumming storytelling may seem quaint in comparison. Still, even if he’s not the voice speaking for the new wave of civil unrest, Young’s is still an essential one, with Peace Trail the latest entry in a storied songbook spanning 60 years of protest. Recently, Bob Dylan made history by winning the Nobel Prize for his contributions to the American musical tradition; while Dylan may be his generation’s poet, Young is the dogged historian, still standing with the protesters, decades after Dylan left them behind. If you’re keeping count, then this is Neil Young’s 38th studio album, and he sounds every bit as engaged—both in his craft and in current events—as he did when he wrote “Ohio” back in 1970. With that in mind, it’s too reductive to label Peace Trail as another notch in Young’s prolific protest oeuvre. While he eloquently flaunts his anger in the face of unchecked police aggression, mob mentality and environmental destruction (the pre-release track “Indian Givers,” which focuses on the Sioux standoff against the Dakota access pipeline, would do Pete Seeger proud), he’s still no less a romantic when it comes to asserting his faith in humanity and his own place in it. Whatever the stakes, Young’s fiery passion—some might even call it his irascibility—fuels the music, as always. It’s front-and center-in the opening title cut, which kicks off with Young taking what might be his most moving turn on electric guitar since “Powderfinger,” and escalates with lines like “Don’t think I’ll cash it in yet…because something new is growin.’” His indelible voice, still as clear and supple as it’s been for more than 50 years, drives the sentiment home with conviction. On Peace Trail, Neil Young forsakes his recent penchant for pointed social commentary in favor of a disarmingly offhanded approach that’s much more effective. Over the course of ten no nonsense tracks, the Canadian musical icon shines a light on our cultural dislocation without making statements or declaring his opinion in any overt way. In fact, it’s fascinating to hear how Young switches perspective from song to song, illuminating various fragments of our dislocated culture in doing so. Within the seemingly glib sloganeering of “Terrorist Suicide Hang Gliders,” he adopts the voice of a fictional character to contrast his own pondering on open borders and immigration. Immediately following, the portrait he paints of “John Oaks” gains as much impact from the track sequencing as the story-line itself, a description of an accidental shooting where the raw instrumental sound matches the emotional content. In a direct reflection of its stark cover art, the loose simplicity of Young’s playing here, mainly backed by two other musicians (drummer Jim Keltner and bassist Paul Bushnell), imparts continuity to the record. A deceptively prosaic, self-referential piece called “Can’t Stop Workin’” echoes the prevailing acoustic foundation of this album, which is also prominent on “My Pledge,” where the use of counterpoint vocal tracks makes the sound effects on “My New Robot,” seem even more contrived. Yet the abrupt ending of that lighthearted contemplation on technology, combined with its placement as the closing cut, prompt reflection on what’s preceded. In the seven studio albums he’s released since 2010, Neil Young has certainly proven that being prolific doesn’t necessarily translate directly to truly inspired work. Peace Trail, however, is worthy of late entry in 2016′s ‘Best Of’ lists. Young’s distinctive paper-thin voice guides the album, quivering with import and plainspoken lyrics that have clearly been thrumming inside him for a while. On “Indian Givers,” he takes aim at the chronic mistreatment of Native Americans; its video, unveiled in September, was released as a show of support with the protests against the Dakota Access Pipeline. (“Show Me,” which creeps along on a delicate riff and a lazy-day bassline, touches on this as well.) The shambolic “John Oaks” is a folk ballad focused on a farmer who’s been slowly radicalized while watching the shoddy treatment received by his workers; Young was one of the founders of Farm Aid, the long-running concert series benefiting family farmers. “Glass Accident,” one of the few tracks to focus on more personal matters, is drenched in regret and reverb. “Peace Trail” is a hard record to get a hold of at times. The songs are so bare-bones — and, at times, meandering — that it feels a bit tossed-off. (Young wrote and recorded the album at rock guru Rick Rubin’s Shangri-La Studios over a weeklong span; “I gave up a lot of disciplines on this record,” he told the Los Angeles Times.) Sometimes the songs suffer, particularly when the arrangements go beyond the guitar-drums-bass setup. The generational lament “My Pledge,” where Young is shadowed by what sounds like his Auto-Tuned ghost, doesn’t quite land, while “My New Robot,” a harmonica-accented commentary on technology’s encroachments on humanity, cedes vocal duties midway through to virtual siblings of Siri and Alexa in a commentary that works better conceptually than it does on record. That Young can make such an idiosyncratic, pointed piece of mass-produced art, though, is a testament to his status as a rock-music beacon who can, possibly, lead his fellow musicians — peers and followers — to a place where they raise their voices as well. The extended story-song of “John Oaks,” a good man murdered for standing up to the government, is clichéd, lugubrious and unconvincing, even if Young seems passionate. But the simultaneous singing and multi-tracked talking of the same words on “My Pledge” gets annoying and distracting quickly, and a lack of motivating melodies in service to preachy lyrics sinks any positive motives Young has to convey his outrage. Closing with the misfire of “My New Robot” where Young reprises his Trans -styled vocoder synthesized voice and name checks Amazon will leave even fans scratching their heads. But the message is no less urgent. From the opening title track, a buzzing rumination on adapting to change or moving on altogether, to the closing “My New Robot,” which counters its future-fear theme with old-school harmonica, the album lacks the focus of Young’s most recent work. Most of the tracks were laid down in just a few takes, and it sure sounds like it at times. The interplay here isn’t nearly as sharp as Young’s impromptu collaborations with Crazy Horse on Everybody Knows This Is Nowhere, Rust Never Sleeps or Ragged Glory. There’s some rugged charm here, especially on “Peace Trail,” “Show Me” and “My Pledge,” which cut their acoustic foundations with electric jabs, but just as often, nobody seems to be on the same page regarding these songs (“Texas Rangers” skips over a basic beat that sounds like it never got out of a first-stab attempt, and “Terrorist Suicide Hang Gliders” is as clunky as its title). It’s occasionally disorienting, maybe deliberately so, but it’s not like Young has catered to fans’ expectations anytime in the past 35 years. Peace Trail puts its message above all else, and like Earth — which included overdubbed wildlife and other natural sounds combined with live performances by Young and Promise of the Real — it’s not too subtle. Which is the point. In a year of political unrest and simmering tension among almost every racial, sexual and class category, Peace Trail is delivered in dire, matter-of-fact bulletins. “I think I know who to blame,” Young sings on one cut. And for 39 minutes, he points fingers, rarely stopping to sort through the mess. After all, there’s another record waiting to be made. Peace Trail, despite reports to the contrary, features a very fine set of songs that is likable from the very first listen. It’s not likable in the way that Harvest Moon was where fans were given the Neil Young that they wanted. But, rather, it’s vintage old weird Neil—naked, loose and unabashed. For point of comparison, it has a bit of an On The Beach vibe with its slowly unravelling songs and at times echoes Broken Arrow and its off the cuff ruminative tone. The songs on Peace Trail explore many of the same themes as those introduced on Monsanto Years, but they communicate in a much more compelling and emotionally gripping way. The title track that opens the album is one of Young’s great meandering narratives, true open and loose. It’s easy to hear how it could be a heck of a vehicle for extended jamming in concert. “Peace Trail,” like the songs that follow it, reflects Young’s environmental and social concerns, but as much as I usually agree with the sentiments he expresses, I’ve never considered Young as a natural anthem writer. By their nature, anthems are not individual reflections and have to appeal to a collective, but Young’s own perspective has always been so idiosyncratic that when he tries to reduce it to slogans or catchphrases it doesn’t work as well as it should. Young has always been at his best when he focuses on the microcosm and sings of small topics. He is a master of detailing offhand moments and reflecting what he sees out his window and relating it to the world at large. Songs like “Indian Givers” or “Terrorist Suicide Hangliders” could have gone terribly wrong were it not for Young’s unabashed and off-the-cuff lyrics that reduce big topics to a personal perspective. The same could be said of “John Oaks,” which—depending on your perspective—may be one of the best or worst songs Neil Young has ever written. Listened to without prejudice and accepted on its own terms, it is a brilliant piece of work. Part scruffy Woody Guthrie ballad, with a liberal dose of Lee “Scratch” Perry-style chanting added for good measure, it is a staggering performance that comes off as completely mesmerizing and absolutely committed. Without mounting a soapbox or howling anti-corporate slogans, “John Oaks” gets its point across much more artfully than any of Young’s other recent political songs. The same could be said of “My Pledge,” in which Young recounts his frustration with everything from the alienating effects of cell phones to the corporatization of Jimi Hendrix music. A deceptively straight chord sequence is the setup for “Terrorist Suicide Hang Gliders”, which soon becomes something of a rant by a tea party advocate that’s already been misinterpreted by one audience member as an anti-Muslim rant. There’s little to be misinterpreted in “John Oaks”, the saga of a modern Johnny Appleseed type whose attempt to speak at demonstration turns tragic. One of the least penetrable tracks is “My Pledge”, which comes off like the stream of consciousness of someone stuck outside of time, particularly when lines are echoed and AutoTuned. He apparently didn’t notice that “Glass Accident” uses the melody of “Beautiful Bluebird” for an otherwise pleasant if thin allegory about protecting the planet once we’ve noticed something’s gone awry. But nothing could prepare the listener for “My New Robot”, which begins as a love song, then describes in detail the unpacking of item in the title before literally “powering off”. The closest comparison we can think of in the pantheon could be side one of Hawks & Doves, but even that sounds tame compared to this program. Some of the rambling in Greendale is echoed, and those harp solos are right off of Sleeps With Angels. 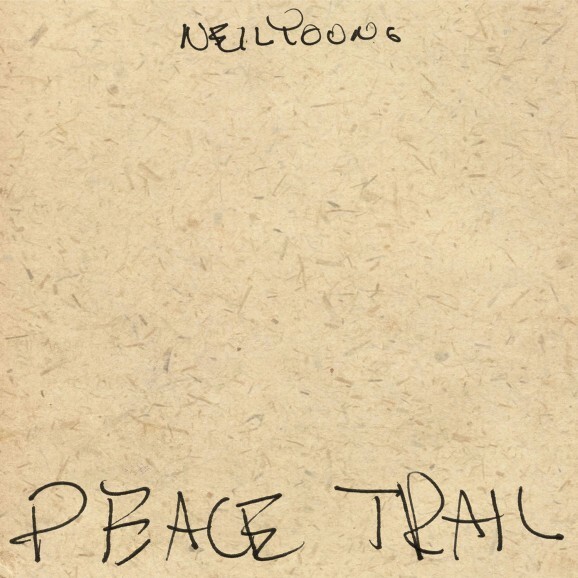 Peace Trail is as intriguing as it is maddening; this is the latest state of the Neil, who’s often been compelled to share his thoughts while they’re fresh and while he still can. At this rate he’ll have something else to say soon enough. Written over four days, Peace Trail follows a cohesive path through the history of colonial exploitation and othering, weaving through the mire of the recent protests opposing the Dakota Access Pipeline for its negative environmental and cultural impacts. Young has demonstrated his unity with the activists at Standing Rock through public statements and performances, including one he gave on his 71st birthday in honor of the protestors. Out of the 10 tracks of Peace Trail, three (“Indian Givers,” “Show Me” and “Terrorist Suicide Hang Gliders”) are explicitly linked to contemporary activist causes. The idiom “Indian givers” is one steeped in a history of racism and exploitation, alluding to the early colonists’ perception that Native Americans cut deceptive deals, making trades out of supposed gifts. Young turns the phrase on its head by using it to describe the current “battle raging on the sacred land.” For the past “500 years,” Young warbles, the indigenous populations of the United States have had their resources, culture and sacred lands robbed from them by European colonists and their descendants; if any one group were “Indian givers,” it would be the settlers. Even in Peace Trail tracks that don’t target current events, Young demonstrates the lyrical and musical acumen that has earned him renown. Given folk’s antiquated roots, Peace Trail simultaneously respects the genre’s grounding and transmutes it into a more modern art form. Of course, being Neil Young, even a near-shambles has an endearing character and fascination; you can’t fault his enthusiasm. His stand against pipelines running through Native American lands (Indian Givers) and the targeting of the Other (Terrorist Suicide Hanglider) are heartfelt, while the admissions in Can’t Stop Working betray a deep sadness and sense of guilt. The two best tracks by some distance are the title number, with Young’s wistful voice counterpointed by signature electric guitar, and Show Me, a bluesy riff on activism that is just the right side of understated. Suffice it to say, Peace Trail is more a quirky footnote than a chapter in a mighty career. Neil Young remains one of the more compelling of the '60s rock stars because he just doesn't give a hoot about pleasing his fans or recycling his greatest hits. On the contrary, he's been particularly prolific lately, producing good, bad and sometimes just plain weird albums at an astonishing rate for a 71-year-old artist who should be in the resting-on-his-laurels phase of his career. "Peace Trail" (Reprise) — his second album this year and sixth since 2014 — is one of the strange ones. It's even occasionally fascinating. It's also not very good, a release that surely would've benefited from a bit more time and consideration, which might have given Young's ad hoc band — drummer Jim Keltner and bassist Paul Bushnell — a chance to actually learn the songs. But the four-day recording session sounds like a getting-to-know-you warmup instead of a finished product. Fans of Young’s fabled screw-you contrariness might argue that there’s a certain pleasing perversity about My New Robot’s return to the vocoder experiments of 1982’s Trans, given the general dismay the vocoder experiments of 1982’s Trans caused in the first place, or indeed about the way Texas Rangers contrives to make a musician as adept as legendary session drummer Jim Keltner sound like he hasn’t got a clue what he’s doing, but the novelty wears off pretty quickly, particularly on the latter track, which is so embarrassing you find yourself wondering where to look as it plays. At least one reviewer has gamely described it as “jazz-influenced”, which tells you more about the endless willingness of diehard Young fans to give the old guy the benefit of the doubt than it does the song itself, which is based around a riff recalling the nursery rhyme This Old Man and resembles jazz only in the sense that it sounds like Young is literally making it up as he goes along. The flimsiness of the music focuses attention on the lyrics, which might well be the point, but turns out to be the very definition of a mixed blessing. Show Me aims for the terse sharpness of Ohio – both songs are done in 10 lines – but somehow ends up sounding woolly, a mass of confused platitudes. John Oaks is a talking blues that at eight minutes seems infinitely longer than the half-hour feedback-drenched jams that so annoyed the punters last time Crazy Horse came to town. It’s obvious from the outset that the titular hero – “a mellow guy … drinkin’ chai and smokin’ weed” – is going to come to a sticky end at the hands of the police who do the shadowy bidding of the giant corporations. By about halfway through, you find yourself willing the police and the shadowy giant corporations to get a move on and whack him, which surely can’t have been Young’s aim. Meanwhile, Indian Givers’ peevish chorus of “I wish somebody would share the news” smacks of both those social media posts that tell you the Mainstream Media don’t want you to know something that’s patently been all over the Mainstream Media like a rash, and of Neil Young’s apparently unshakeable conviction that he’s the only musician currently writing protest songs: a theory that was demonstrably ridiculous when he mooted it around the time of 2006’s Living With War – an album that arrived in the shops 18 months after Green Day’s 15m-selling American Idiot – and seems even more ridiculous now, in an age when Beyoncé pays homage to the Black Panthers at the Superbowl and hip-hop feels more explicitly politicised than it has in years. That said, there are moments when Peace Trail fitfully sparks into life. The frequent blasts of distorted harmonica that whack you in the face feel suitably disruptive, while the title track is genuinely great: a song admitting Young’s confusion at the sheer pace of current events, it’s infinitely more impactful and affecting than all the sloganeering and hectoring around it, not least because it boasts the album’s solitary indelible tune. “Indian Givers” sets a counter-cultural message to a subtle acoustic blues shuffle, while “My Pledge” combines gentle folk-rock with clenched-fist sentiments and voice software-distorted vocals, a surprisingly nuanced response to the new musical landscape. “My New Robot” ends with some robust Luddite humour, Young drowned out by a chorus of computer voices chirruping about pin numbers and seven-digit passwords over an addictive groove that abruptly powers off. Somehow the idea of obsolescence has brought out the best in Young. Thanks Charlie. We have also been hearing this sort of comment for sometime now regarding Neil's lyrics. These are not excuses for "weak lyrics". These are the facts as to why. As for us? We're on same page as Micah. F the subtle poetry. There's a job to be done. There is no doubt that Native American communities have historically suffered at the hands of the federal government. But to litigate that history on the back of a legally permitted river crossing is absurd. Mr. Cramer, a Republican, represents North Dakota in the U.S. House. I've listened to the new album from beginning to end without interruption one time. Much to my surprise, I thought it was pretty good. Overall it has a consistent lyrical and musical feel, and though the lyrics and melodies aren't vintage Neil, they're not nadir Neil either. Some of the lyrics were provocative and telling, and Neil's voice/singing is better than I expected. At times vulnerable, at times determined, at times lost, the emotions are there at or just beneath the surface. Anon > This isn’t about water protection. Years before the pipeline was announced, the tribe was working with the Bureau of Reclamation and the Army Corps to relocate its drinking-water intake. The new site sits roughly 70 miles downstream of where the pipeline is slated to cross the Missouri River. Should they believe if the pipeline fails & the oil leaks, pours or rushes into the Missouri it won't negatively effect their water supply because its 70 miles down river? Would you bet your water supply on that? I wouldn't. @Topanga D - Thanks for the comment and actually listening to the entire presentation. Agree on final cut being yet another distinctive track in the NY canon. We're working on spin #2 and hope to have more to say by the end of the weekend. I've listened 6 times straight through, once on headphones. I love it, other than Texas Rangers which I am really struggling with, I think it is genuinely fresh and a move forward. Was is really pi$$ing me off is Warners Bros messing up the download release again. I've ordered the vinyl and had nothing delivered. Listening on Spotify instead. I just listened to it for the first time. Pretty cool album. Not a new instant classic or anything, but a solid album. Thematically, it is an interesting album. The first two songs see Neil reflecting on his recent work and political action. There's an intriguing weariness in "Peace Trail," while "Can't Stop Working" hints at something uneasy below the surface, looking for "forgiveness." Tracks 3-8 see Neil step out of himself, assuming different characters reflecting on the problems of today. "Glass Accident" sees Neil again reflect on his recent work, albeit metaphorically. "My New Robot" is immediately my favourite. A really interest contrast between a quaint domestic scene and the impersonal essence of the "robot." I like the performances, overall. Raw and real. Neil's audio verite approach is frankly refreshing in the age of compression, perfectionism, digital recording and pro tools editing. I really like the auto tune - a new sound even after all these years. My only criticism is that some of the middle tracks are not that interesting musically - especially John Oaks. It repeats the same melody line over and over, with only two chords in the verse and one in chorus. But hey, I like that Neil follow his whims. It is okay if he sometimes come up short. I like it more and more every time I hear it. It's probably my favourite NY album since Greendale except for Psychedelic Pill. It's pleasant, honest, pretty, effortlessly passionate and sounds great. It's like having him over for drinks and handing him a guitar once he's had a few. Thanks Neil. If the album didn't have the awful "Texas Rangers",it wouldn't be too bad. That tune is worse than awful, a strong candidate for worst NY song ever. The rest of the album is moderately pleasant, but unworthy of my favorite artist, the man who gave us "Psychedelic Pill" and "Le Noise" quite recently. That's just my humble opinion anyway. @ ANDREW - bummer on the vinyl and having to stream in the meantime. Also, let us know if your herar any sonic difference with vinyl. @ Andy - glad you're enjoying. yes, a solid & interesting album that's both raw and real. Even with modest expectations at this stage of his career, who can complain? "My New Robot" is definitely something different. @ mrtew -"It's like having him over for drinks and handing him a guitar once he's had a few." Now that's a good image. @ Jesús - Humble opinions are always appreciated here. It helps us keep it REAL. btw, anyone figured out the line about "Abraham & Martin & John" in the song "My Pledge"? Dion song. 1968. When I first heard Neil sing it, I heard the 1968 melody in my head. We're all fans so let's best honest with ourselves at least it's another Neil stinker. Andy - sorry can't agree. I genuinely love it. I'm making no comparisons with anything in the back catalogue, just listening to the latest work of a 71 year old man. He's said in recent years that he hasn't got long left on the planet and just wants to work, whether playing live, writing or knocking out albums with 4 days work. I'd rather get the fast paced churn we are getting now than him hunkering down for a couple of years to work on one album. Yes, he was talking about Landing on Water. But the quote certainly applies here. Title track is decent but the rest is really lame. The lyrics are horrible. If it wasn't by Neil Young anyone would dismiss it immediately. I'd rather he wait until he has some good tunes instead of just dumping this kind of stuff every year. I was surprised at how much I like this album. Neil is getting older and his songs are changing. The album has some beautiful moments. In terms of lyrics, I felt them, they go right in, there is no need for scrutiny, just let the magnets attract. Connect the dots or thoughts or something. @Llamajacket - good deal. Always nice to connect the dots. @DC - Thanks. Incidentally, we tracked down the song Abraham Lincoln, Martin Luther King Jr and John Kennedy. As you say by Dion. w/lyrics. Song also references Robert Kennedy, as well. 4 men fallen in the prime of life... the dream never dies.